Our U11’s Boys Football Teams have been extremely busy of late. 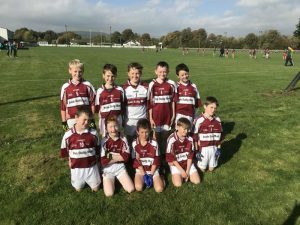 Our first blitz took place in Drombane where they won their first two games before losing out narrowly to Gaelscoil Nenagh in our third game. Some terrific performances were on view throughout the day where all of the boys gave their best efforts for SNC! On Wednesday 07/11/18, our second blitz took place in The Ragg. The boys won their first two games setting us up for a titanic battle with Gaelscoil Nenagh once again. This time, the boys won by one point with some amazing efforts in defence! Unfortunately, we lost the final to New Inn BNS in the County Final by the smallest of margins on a scoreline of 2-1 to 2-0. Comghairdeas libh!